Bitcoin Cash (BCC or BCH depending on the exchange) has successfully forked yesterday around the planned time, but things are still moving slow. Some of the exchanges such as Bittrex and Kraken were pretty quick to respond in crediting users with BCC/BCH coins and launching trading. The increased demand and high volatility however is still causing issues for some exchanges such as Kraken that apparently is having trouble with their infrastructure handling the load. Still most if not all exchanges that started supporting Bitcoin Cash and offer trading have not yet enabled deposits from local wallets. Even if they do at the moment, it could still take a day for a transaction to be confirmed and be credited in the exchange. We still need to wait a bit more for the difficulty of BCC/BCH to adjust to the significantly lower hashrate and the blocks to start moving at a faster pace as they are currently taking a lot of time, much more than just 10 minutes per block. The price volatility of Bitcoin Cash is very likely to continue as there is a lot of speculation and actually not that much coins in circulation in exchanges. It seems that quite a lot of people proffered to keep their BTC and get BCC/BCH with a local wallet where they have full control over the private keys and the coins inside. This means that the coins in exchanges will remain less than apparently the demand there is at the moment, but as soon as deposits to exchanges are allowed the Bitcoin Cash price may start a downward trend. This is especially true if most people do what they were planning – namely dumping the “free” BCC/BCH coins they have received for BTC or other altcoins. Still, we are yet to see what is going to happen as things may end up very different than what some people expected or planned. We are still in favor of Bitcoin (BTC) over any forks such as Bitcoin Cash (BCC/BCH), but the new fork is already getting decent support and slowly building momentum. If you take a look at the coin market capitalization, then you might be surprised that the market cap of Bitcoin Cash (BCC/BCH) is already at almost 8 Billion USD and that is placing the currency as number 3 in terms of capitalization. BCH is just after Bitcoin (BTC) and Ethereum (ETH) in terms of market capitalization, but that is the situation at the moment and with the high price volatility things could change at any moment. Ripple (XRP) is not that far behind on the 4th place at the moment, so even a slight change in price may cause BCC/BCH to lose its 3rd place. 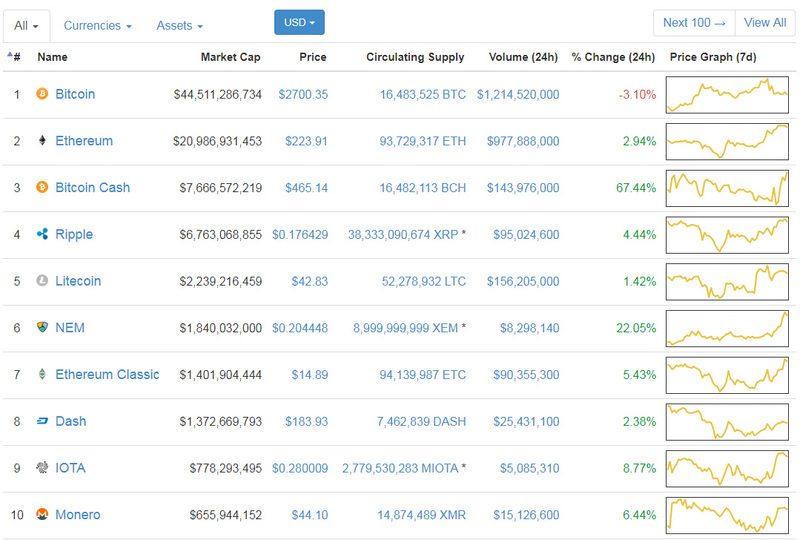 Litecoin (LTC) is number 5 and it is with much smaller market cap in order to take one of the higher places. Anyway a significant price correction with deposits enabled on crypto exchanges and much higher trading volume of Bitcoin Cash could as well shake things up or down significantly, so be prepared for this as well. It seems that the last few days and probably until 1st of August a lot of people are consolidating their crypto coin holdings into Bitcoin (BTC) in order to take advantage of the Bitcoin Cash fork and the fact that they will get the same amount of BCC as they hold BTC. As a result we are seeing a drop in the prices of altcoins and a peak of the price of Bitcoin as people are selling altcoins for BTC apparently. If you want to take advantage and be able to claim any BCC coins for any Bitcoins you currently own you need to be careful how and where you store your BTC. Obviously the best solution would be to run a local wallet and have full control over your wallet’s private key, but some people prefer to have their coins in crypto exchange so they are available for quick trades. If you want to keep your BTC on an exchange, but still want to be able to get Bitcoin Cash coins you will need to make sure that your coins are on an exchange that will support BCC and not all of the big and popular ones will do initially or at all. Furthermore if you are planning on dumping or trading any BCC coins then you might want to be extra careful as the first few days it is highly likely there will be huge volatility in the price of Bitcoin Cash. Another important thing, Bitcoin Cash is initially using BCC as a coin ticker and that may be a bit confusing as BCC is already being used by BitConnect. As a result some exchanges may actually use a different coin ticker symbol instead of BCC in order to avoid confusion or maybe create even more. It is possible that Bitcoin Cash may be listed with BCH as a ticker on some crypto exchanges, so make sure you do not make mistakes and trade the wrong coin asset. There of course are not all of the crypto exchanges out there, just some of the major international ones that we have covered. If you are suing the services of a smaller or a local crypto currency exchange, then it is best to inquire them about their position regarding the support of Bitcoin Cash and if they will be crediting BCC/BCH coins to their users and if they will be offering trading as well. For now Kraken seems like a good choice to store your BTC if you want to be able to get BCC/BCH coins and after that be able to trade them. Of course there is a number of other exchanges that announced they will be most likely be supporting Bitcoin Cash such as ViaBTC, OKEX, LiveCoin at launch as they were already mentioned in the announcement thread on Bitcointalk.